(NaturalNews) In larger numbers, Americans who want to be better prepared in case of natural or man-made disasters don't simply want to "settle" for just any food to eat: Even in less-than-desirable conditions, they want healthy food to sustain them. That's why growing numbers of "preppers" -- the nickname given to those who make it a point to prepare for a day when the "stuff" hits the fan -- are following the same trend as the rest of the American public; they are going organic. The tech site went on to note that, for anyone looking for a "survival seed vault," there are several companies that promise fine non-GMO, non-hybrid heirloom seed banks, which can be found on their website or through a simple Google search. In fact, the motto from one of the sellers, Texas Ready, is: "We believe that the happiest people on earth will be the ones who've prepared should the unthinkable happen. Take it from us, the happiest emergency preparedness planners on the planet, that you can thrive with a positive mental attitude." And anti-GMO foods and seeds. By all accounts, it was a festive atmosphere at the Arizona Prepper Fest this past March. In the official Prepper Fest program, you could find out how to join a group called the "Oath Keepers" who will "mobilize to protect this country from a tyrannical takeover.... if and when the dreaded 'executive orders' that are poised to be implemented at the president's whim are launched." It went on to say that most preppers are often accused of being "conspiracy theorists," and that anything concerning them is regularly branded by the mainstream media as unsubstantiated hysteria. And yet," the media typically does little if any research into the concerns before dismissing them," the manifesto says. The guide instructs readers who have questions about GMOs to talk to Jared Keen, who is "not a prepper, but an anti-GMO activist" and founder of Plant Based Nation, as well as the director of Right To Know Arizona, a group that supports GMO labeling of foods. "There's never been an issue where you have the nexus of government inaction, corporate inaction and a political system that's unstable," [Keen] told a man from Flagstaff in a camouflage cap who stopped by his table. "This is your chance to make a stand and be part of this." 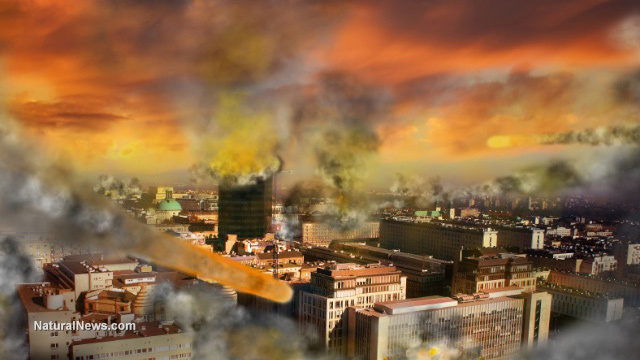 Anti-GMO preppers don't all believe that the apocalypse will be brought about by the collapse of governments. It could come about as the result of a major natural disaster or act of terrorism. Or it "may be as simple as pollen floating from one field to contaminate the next one, until we are starving to death or dying of cancer."